The Elevation of the Cross, celebrated on the fourteenth of September, commemorates the finding of Christ's Cross by Saint Helen, the mother of the Emperor Constantine in the fourth century; and, after it was taken by the Persians, of its recovery by the Emperor Heraclius in the seventh century at which time it was "elevated" in the Church of the Resurrection in Jerusalem. From this latter event the "universal elevation" of the Cross was celebrated annually in all of the churches of the Christian Empire. The day of the Elevation of the Cross became, as it were, the national holiday of the Eastern Christian Empire similar to the Fourth of July in the United States. The Cross, the official emblem of the Empire which was placed on all public buildings and uniforms, was officially elevated on this day by the bishops and priests. They blessed the four directions of the universe with the Cross, while the faithful repeated the chanting of "Lord have mercy." This ritual is still done in the churches today after the solemn presentation and elevation of the Cross at the end of the Vigil service of the holy day following the Great Doxology of Matins. The troparion of the feast which was, one might say, the "national anthem" sung on all public occasions in the Christian Empires of Byzantium and Russia, originally petitioned God to save the people, to grant victory in war and to preserve the empire "by the virtue of the Cross." Today the troparion, and all the hymns of the day, are "spiritualized" as the "adversaries" become the spiritually wicked and sinful including the devil and his armies, and "Orthodox Christians" replace the names of ruling officials of the Empire. O Lord, save Thy people and bless Thine inheritance. Grant victories to the Orthodox Christians over their adversaries; and by the virtue of Thy Cross, preserve Thy habitation (Troparion). As Thou was mercifully crucified for our sake, grant mercy to those who are called by Thy name; make all Orthodox Christians glad by Thy power, granting them victories over their adversaries, by bestowing on them the invincible trophy, Thy weapon of peace (Kontakion). The holy day of the Elevation of the Cross, although it has an obviously "political" origin, has a place of great significance in the Church today. It remains with us as a day of fasting and prayer, a day when we recall that the Cross is the only sign worthy of our total allegiance, and that our salvation comes not by "victories" of any earthly sort but by the only true and lasting victory of the crucifixion of Christ and our cocrucifixion with him. When we elevate the Cross and bow down before it in veneration and worship to God, we proclaim that we belong to the Kingdom "not of this world," and that our only true and enduring citizenship is with the saints in the "city of God" (Eph 2:19; Heb 11:10; Rev 21-22). The first Old Testament reading of the Vespers of the day tells of the "tree" which changes the bitter waters into sweetness -- the symbol of the Tree of the Cross (Ex 15:22-16:1). The second reading reminds us that the Lord chastens and corrects those whom he loves and that Divine Wisdom is "a Tree of life to those who lay hold upon her and trust in her, as in the Lord" (Prov 3:11-18). Again the reference is to the Cross which is, as the epistle reading of the day proclaims, "to those who are called ... the power of God and the wisdom of God" (1 Cor. 18-25). The third Old Testament reading is from the Prophecy of Isaiah which tells of the "city of the Lord" where both Jews and Gentiles will live together and "shall bow themselves down" at the place of God's feet and "shall know that I the Lord am Thy Saviour and Thy Redeemer, the mighty One of Israel" (Isaiah 60:11-16). Here we have the direct reference to God's city where men shall worship at his feet; and together with the psalm line repeated constantly during the services which calls us to "bow before his footstool," we have once again the reference to the Holy Cross (Ps 99:5, 110:1, et al.). This central hymn of the Elevation of the Cross which lasts for eight days in the Church is sung many times. It replaces the Thrice-Holy of the Divine Liturgy. The normal antiphons are also replaced by special verses from the psalms which have direct reference to Christ's crucifixion on the Cross (Ps 22, 74, 99). At the Matins, in the gospel reading from St John, Christ says that when he is elevated on the Cross he will draw all men to himself (Jn. 12:28-36). The long gospel reading at the Divine Liturgy is the passion account from this same gospel. Thus, at the Elevation of the Cross the Christians make their official rededication to the crucified Lord and pledge their undivided allegiance to him by the adoration of his holy feet nailed to the lifecreating Cross. This is the meaning of this holy day of fasting and repentance in the Church today. 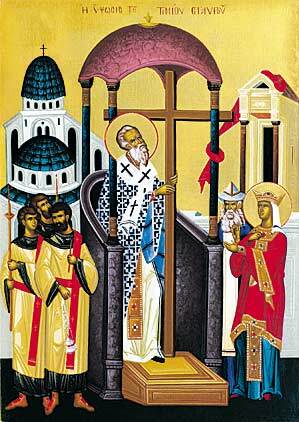 On Sept. 14 Orthodox Christians will be celebrating the Feastday of the Elevation of the Cross. I have read quite extensively on this Feastday and what I find somewhat confusing are the synonymns used with reference to this Feastday. Please explain : elevation; exaltation; glorification; adoration; veneration. Devotion to the Holy Cross of our Lord, God and Savior Jesus Christ goes back to the very beginnings of Christianity. There is even a whole branch of theology which studies the significance of the Cross in Christianity called, "Stavrology" ("Stavros" is Greek for "Cross"). The Feast of the Elevation of the Cross goes back to the time of St. Helen who found it in Jerusalem after a person who had died was brought back to life after being placed on it. That Feast is a fast day in the Orthodox Church and there is a richly meaningful rite conducted in Church by the Priest when he faces the four corners of the world and slowly lifts a Cross in his hand as he chants "Lord have mercy" each time. We bless ourselves with the Sign of the Cross, we wear a Cross, we truly venerate and honor the Holy Cross by which our salvation was effected. The terms you relate to refer to the same devotion. We elevate the Cross because it is above all the Key by which Heaven is opened to us. We glorify the Cross which is so closely identified with Christ Himself. We venerate the Cross which has the Power of Him Who was crucified on It for our sins and which works miracles through that Power. We adore the Cross because it is an Icon of Christ Himself, pointing to Him directly. The wood of the Cross itself is not significant, but the Person Who had, as the Octoechos sings, "His hands and feet run through with nails" on it is of Eternal Significance. Orthodoxy venerates Relics, as it does Saints, since, as a result of the Incarnation of God's Son, matter can be a vessel of Divine Grace for all who use it with faith and prayer.